Thursday May 9th 1878 We all felt smart this morning and got the work done up by ten oclock. Mollie Robinson came this morning. I sewed in the afternoon made a shirt for Ott. Hatt went over to stay all night with Win she is sick. Mollie stayed with me. I sewed a little in the evening. This is Hatts birthday she is 21 years old. Friday May 10th 1878 I had partly got the work done this morning when Hatt came home saying Win was no better. I got ready and went over after her. Mollie stayed here till after supper and we sent her over to Custors. We had a picture of the house and family taken today. 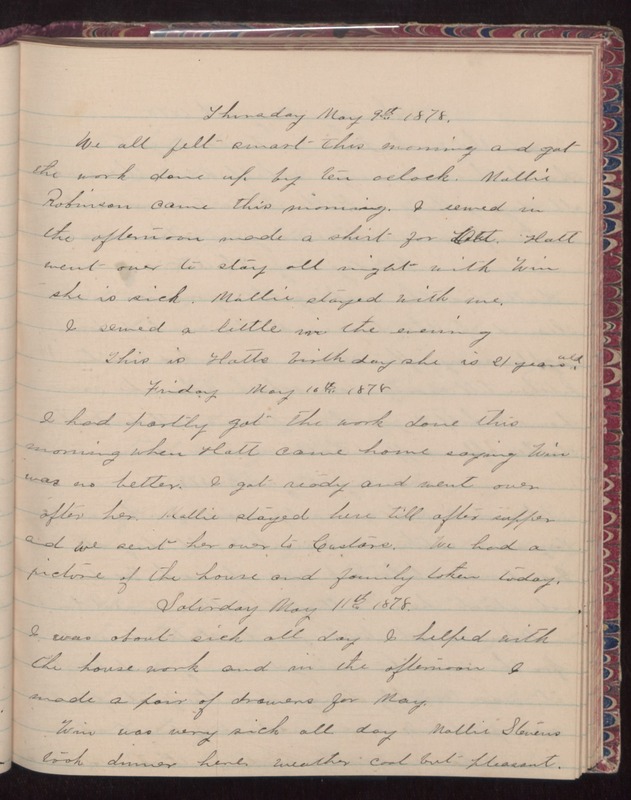 Saturday May 11th 1878 I was about sick all day. I helped with the house work and in the afternoon I made a pair of drawers for May. Win was very sick all day. Mollie Stevens took dinner here. Weather cool but pleasant.